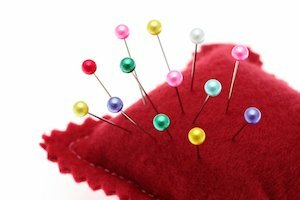 Pin cushion, a simple sewing project and essential for your sewing kit. Start your sewing kit with this easy kid's beginning sewing projects. Batting-You can stuff sand in your cushion also, about 1/2 stuffing and 1/2 batting. The sand can help sharpen your needles and pins. Cut two pieces of felt 4 x4 inches in size. Sew three sides on the sewing machine. Back stitching to secure your stitches. Turn right side out. Stuff your cushion with stuffing or batting. Hand sew the end shut. Use this as a pin and needle cushion. 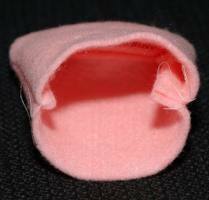 You can add a strip of 1/2-1 inch elastic to your cushion. Measure a piece of elastic from one side of the wrist to the other then add a 1/4-1/2 inch more to make it easier to get on. Hand sew each end of the elastic to your cushion. Now you can use this on your wrist while you sew. For each mini cushion cut out a 3 inch circle. You can use a wide glass or a canning jar lid for a pattern. Gather stitch along sides of circle. Gather together. Stuff with batting. Pour hot glue in a bottle cap and insert ends of gathered material. Decorate edges of bottle cap. Allow to dry. 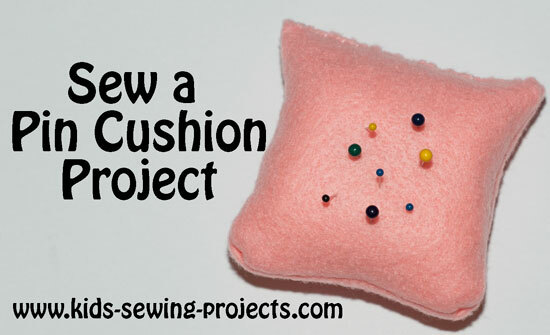 This is a fun sewing project you can add to other sewing notions for a sewing kit. 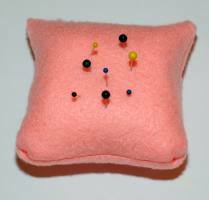 Back to Level 2 sewing from Pin Cushion.